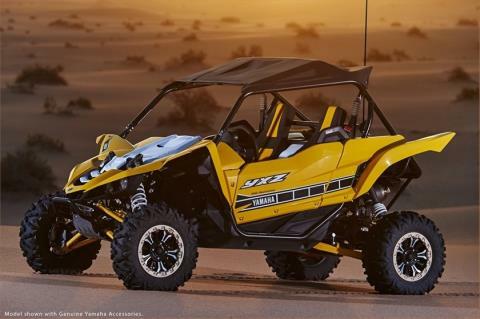 Unmatched SxS Performance: The all-new YXZ1000R SE doesn’t just reset the bar for sport side-by-sides, it is proof that Yamaha is the leader in powersports performance. 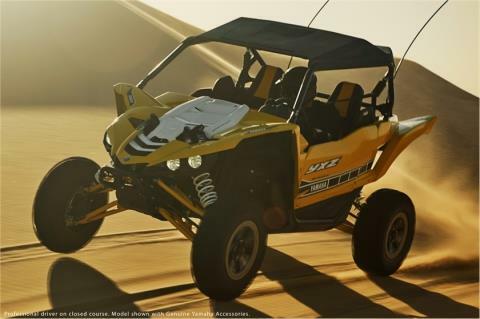 Featuring a new 998cc inline triple engine mated to a 5-speed sequential shift gearbox with On-Command® 4WD, massive FOX Racing Shox® suspension front and rear, and styling the competition can’t touch, the new YXZ1000R SE is in a class by itself—the only true pure sport SxS ever developed. Stunning, Industry-first Three-Cylinder Engine: Prepare yourself for the industry’s first 998cc inline-three cylinder sport side-by-side engine. 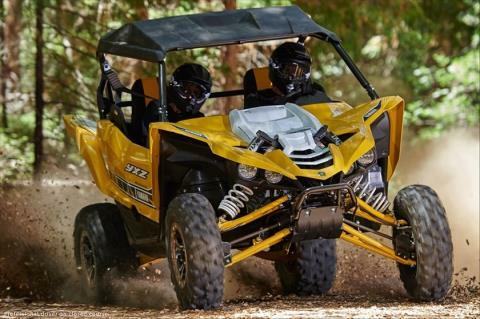 Featuring a compact DOHC twelve-valve cylinder head, an aggressive 11.3:1 compression ratio and high-tech dry-sump lubrication, the YXZ1000R SE engine offers jaw-dropping power, fantastic midrange torque and a thrilling 10,500 rpm redline. 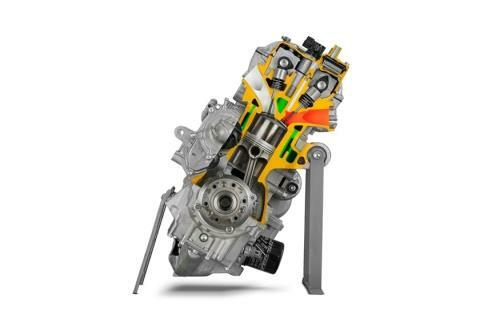 With lightweight 80mm forged aluminum pistons and a counterbalancer, the motor is exceptionally smooth-running, too. 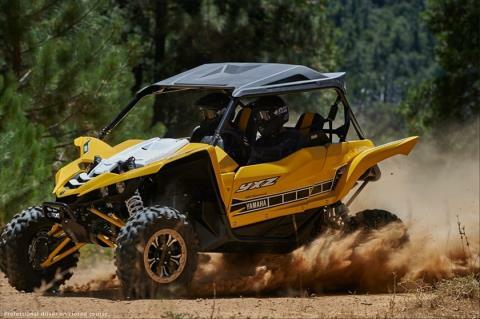 Built for the pure sport SxS enthusiast, there’s nothing else like it. Terrain Conquering, Fully-adjustable FOX Podium RC2 Shocks®: Jutting defiantly through the front hood and defining the rear of the vehicle, the YXZ1000R SE's huge piggyback FOX® 2.5 Podium RC2 Shocks® bring visual impact with unmatched performance. 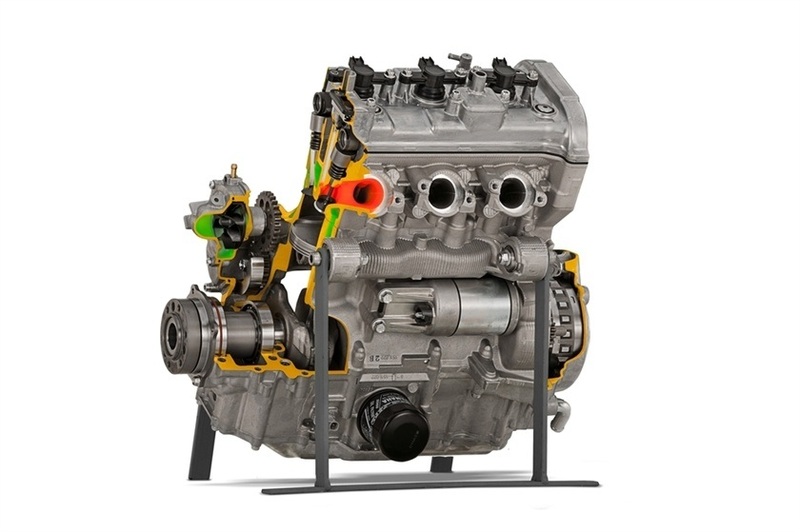 All four corners are fully adjustable—spring preload, rebound and both high- and low-speed compression damping—with a huge 16.2 inches of front travel and 17.0 inches at the rear, with integrated Bottom-Out technology as well as front and rear sway bars. 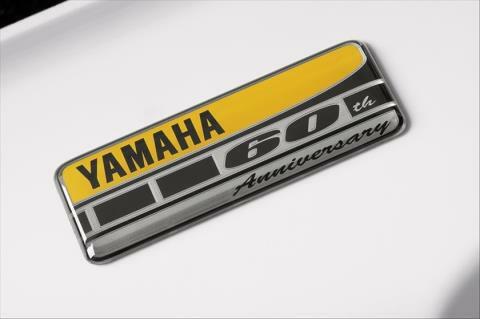 Result: The ultimate in ride quality, tuneability and handling. 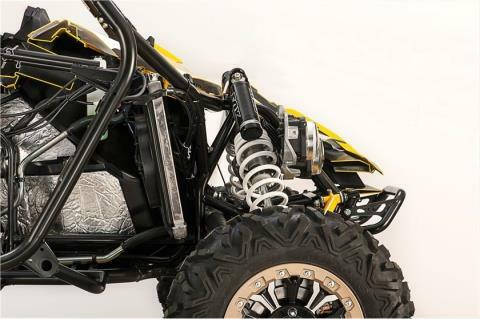 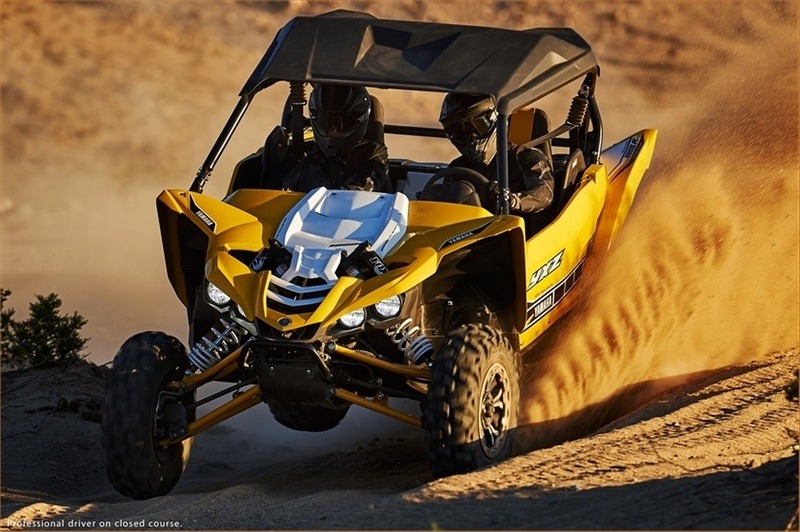 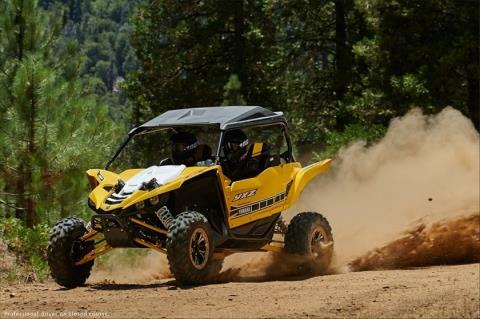 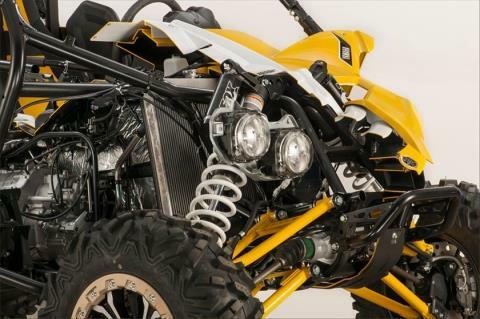 Whether you’re riding in dunes or dirt, the YXZ1000R SE suspension will handle the toughest terrain. 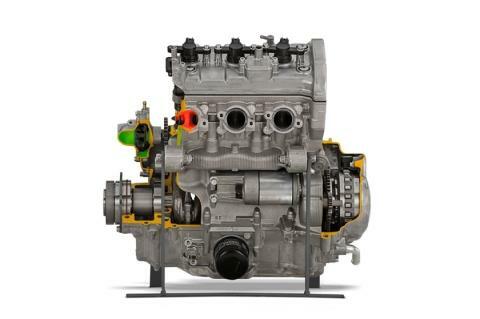 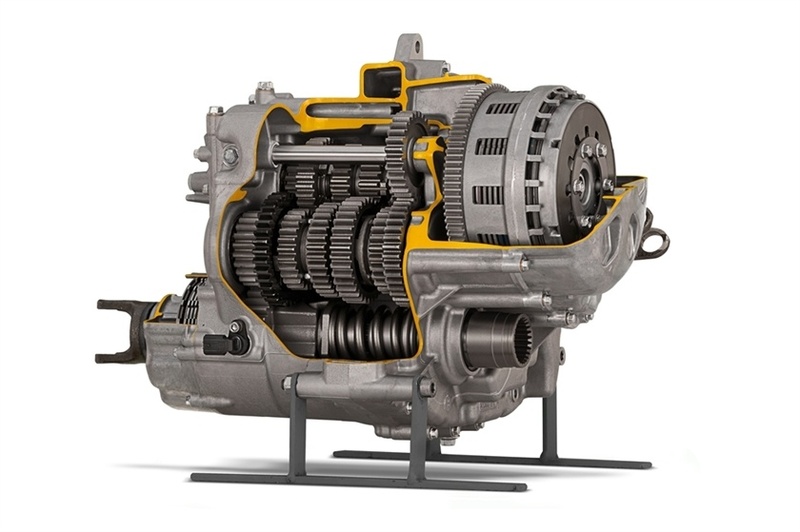 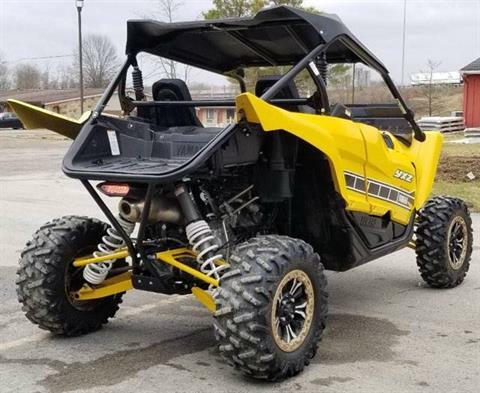 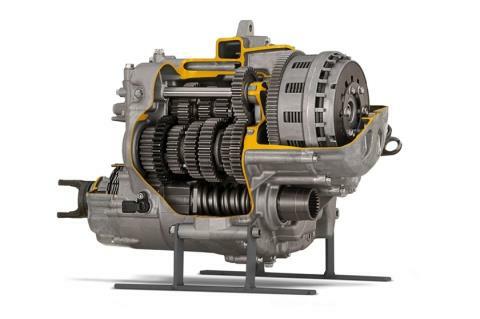 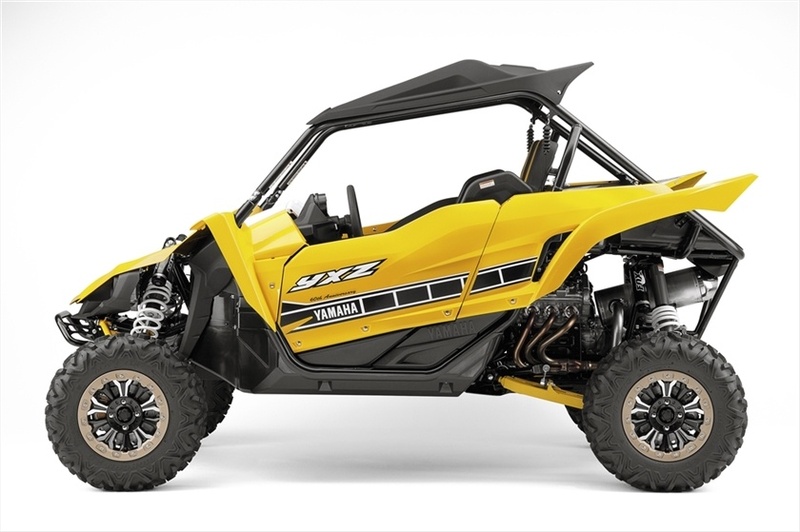 Industry-first 5-Speed Sequential Transmission: The YXZ1000R SE utilizes an all-new sequential 5-speed manual transmission with reverse that permits rapid and smooth shifting, ideally matched to the potent three-cylinder engine. 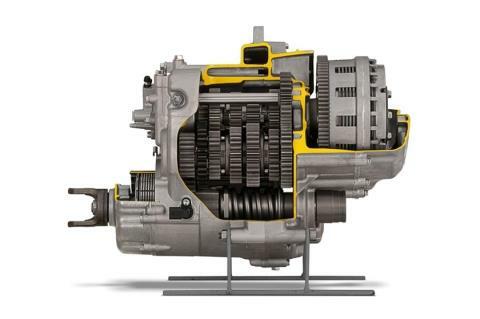 A beefy hydraulically-actuated clutch system is operated by a foot pedal for light, consistent feel - delivering power up to 20% more efficiently than most automatic CVTs. With an amazingly direct connection between throttle and the drivetrain, this new transmission gives the YXZ™1000R SE an entirely new sports SxS experience that is unmatched by any other machine. 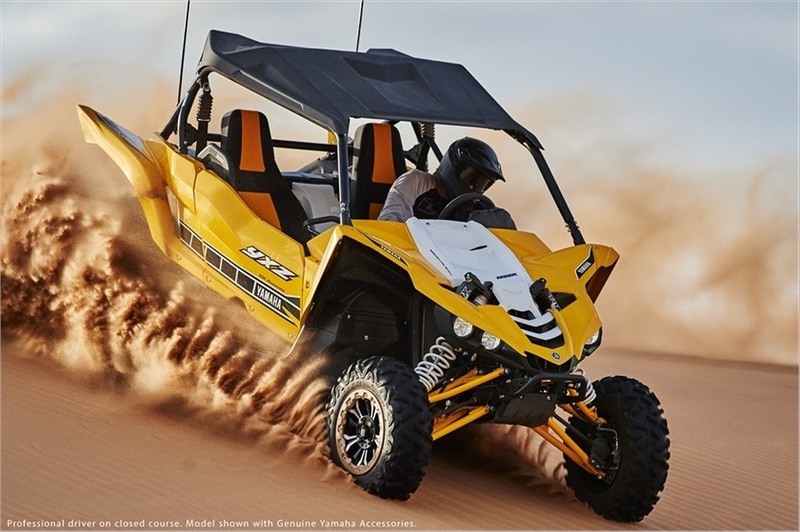 Yamaha’s Exclusive On-Command® 4WD: With the twist of a dial, On-Command 4WD gives the driver ultimate traction, with easily selected 2WD and 4WD full diff lock modes. The YXZ1000R SE's all-new drivetrain incorporates Yamaha’s proven On-Command 4WD system to tackle the most challenging terrain. Aggressive New Style: Radical, aggressive chassis and styling—highlighted by massive suspension components jutting into view—shows off Yamaha’s passion for powersports. And form follows function, as the front suspension design permits an extremely low hood line for excellent trail visibility. 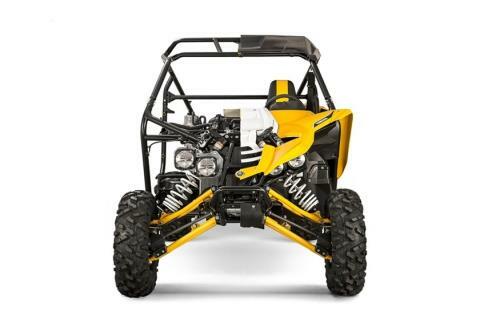 The YXZ1000R SE is the new benchmark for performance side-by-sides, built for enthusiasts looking for a pure sport machine with the confidence and attitude to tackle any challenge. 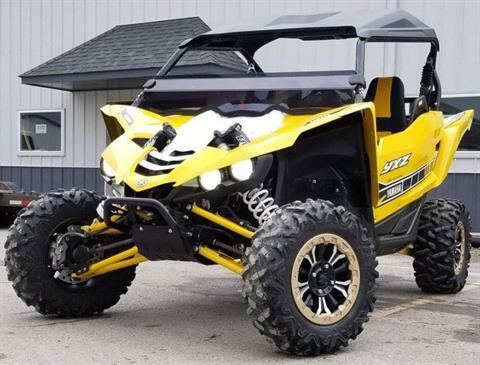 Terrain Conquering, Fully-adjustable FOX Podium® RC2 Shocks®: Rising defiantly through the front hood and defining the rear of the vehicle, the YXZ1000R SE's FOX 2.5 Podium® RC2 Shocks® with huge piggyback reservoirs bring visual impact and unmatched performance. All four corners are fully adjustable—spring preload, rebound and both high- and low-speed compression damping—with a huge 16.2 inches of front travel and 17.0 inches at the rear for the ultimate in ride quality, tuneability and handling. 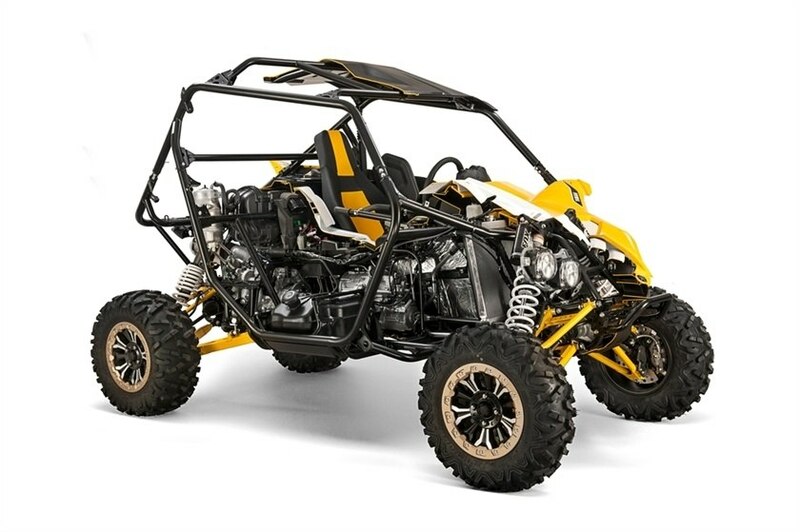 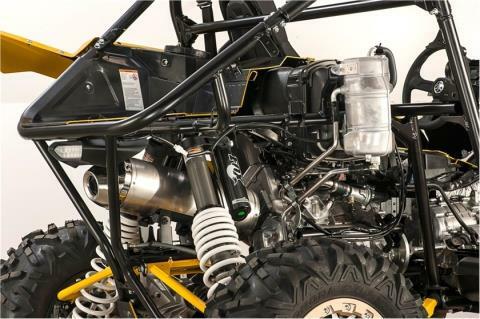 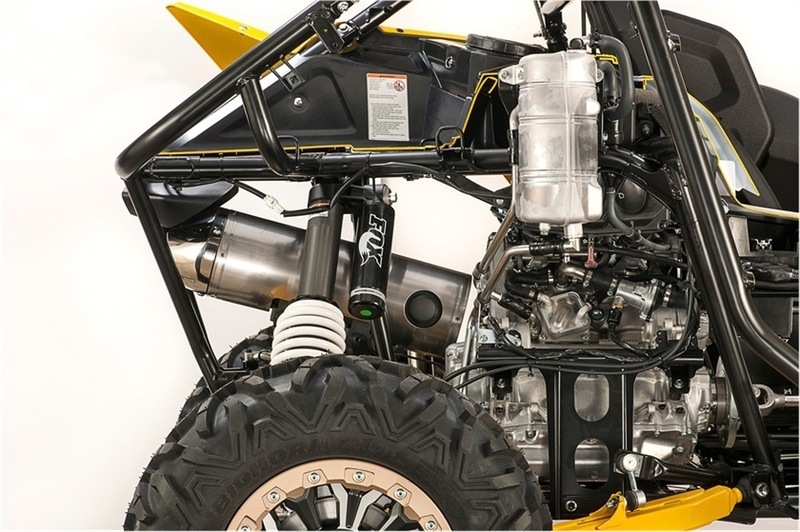 Pure Sports Chassis: Optimized frame dimensions make the YXZ1000R SE the best handling sport SxS... ever. In addition to the performance and durability that comes with Yamaha’s exacting standards, the YXZ1000R SE also includes extensive occupant protection without sacrificing driver visibility, and a full-frame composite underbody skidplate protects the chassis from rocks and debris. 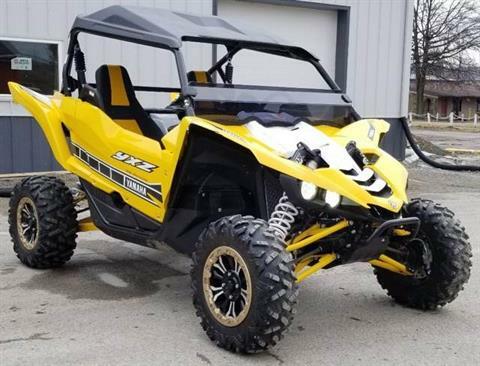 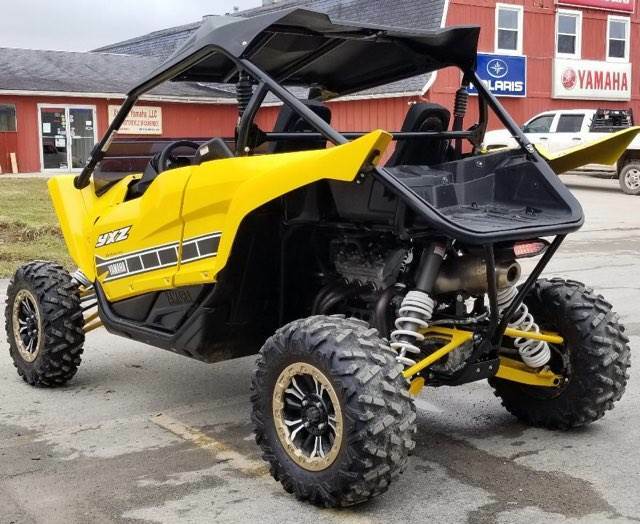 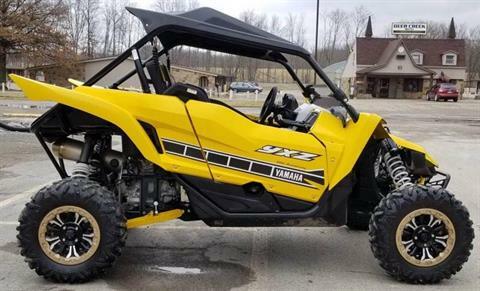 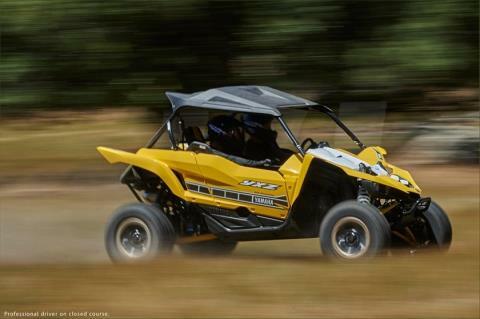 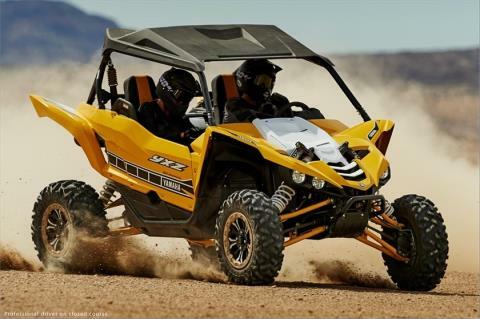 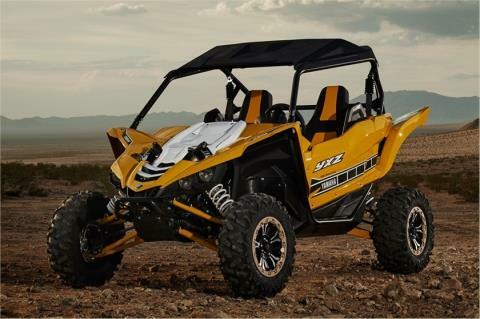 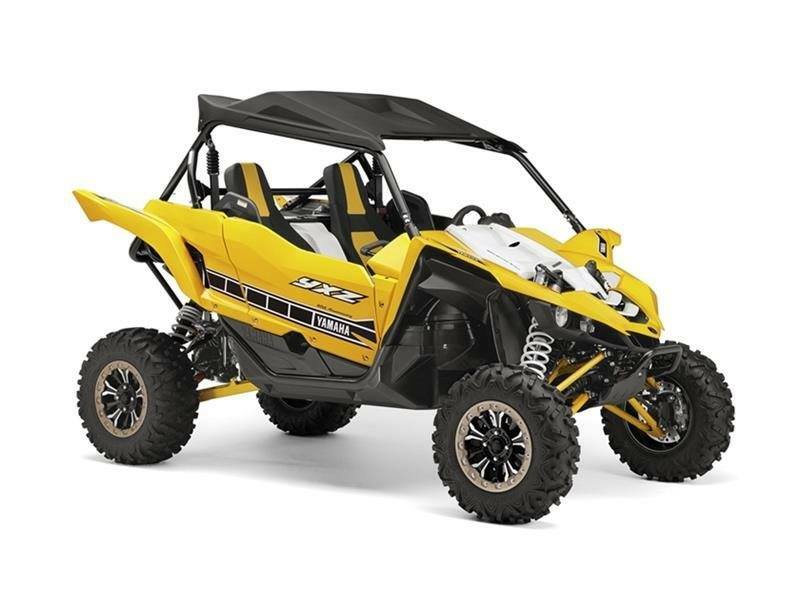 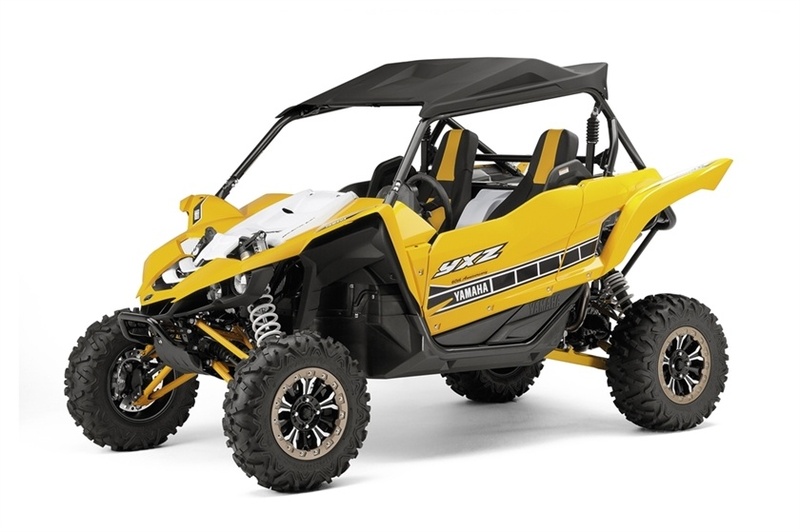 Yamaha Electric Power Steering: The YXZ1000R SE features Yamaha’s class-leading speed-sensitive EPS, for reduced steering effort and precise handling in virtually all conditions. 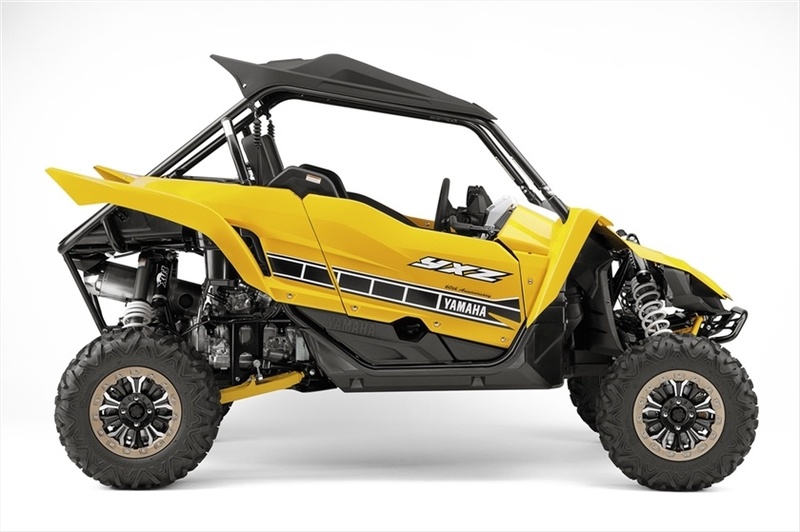 The EPS unit is lightweight and compact, mounted high on the new rack-and-pinion steering system, further protecting it from dirt and debris. 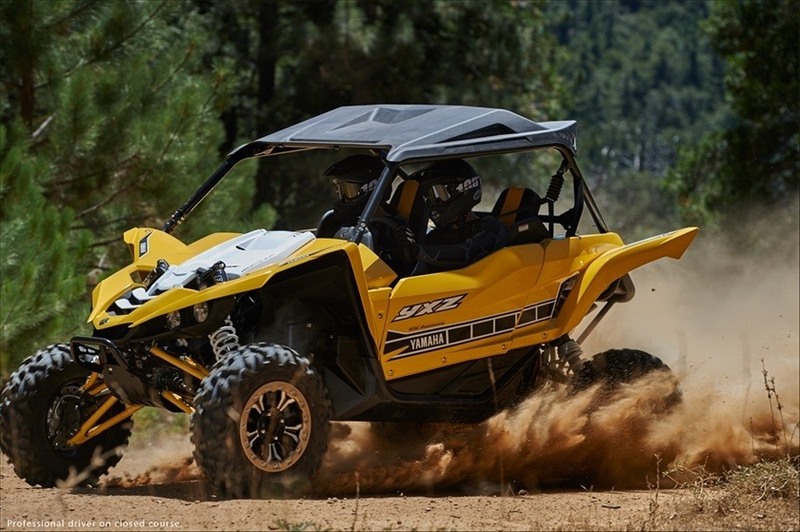 Powerful All-Wheel Disc Brakes: The YXZ1000R SE offers precise braking control thanks to twin-piston calipers clamping down on 245mm rotors at all four wheels, for excellent braking power, feel and fade-resistance under hard use. 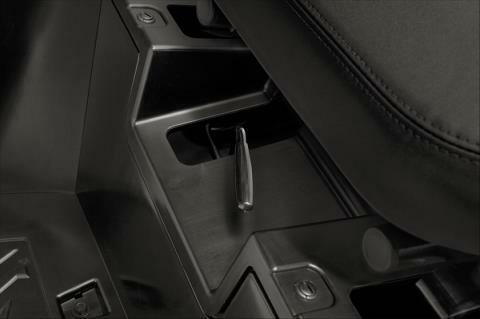 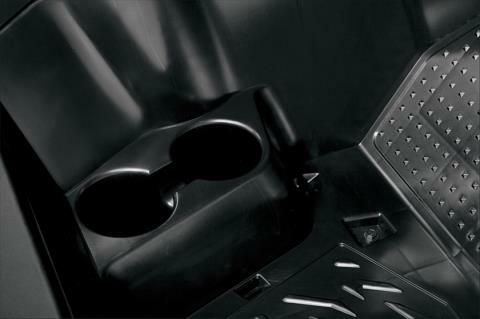 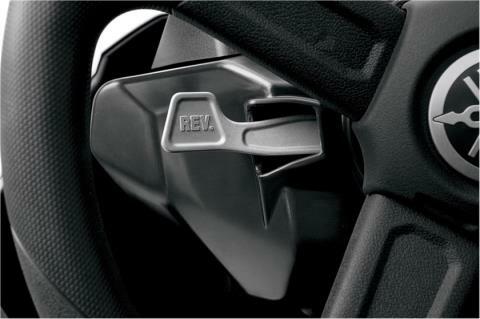 An automotive-style parking brake lever is mounted in cabin’s center console. 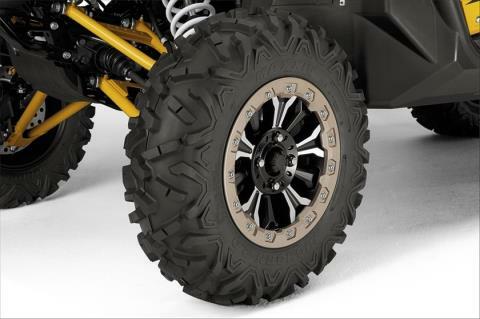 Exclusive 27-inch Maxxis® Tires with Bead Lock Wheels: Developed exclusively for Yamaha, the YXZ1000R SE mounts 27-inch Maxxis® Bighorn 2.0 radial tires that offer extreme performance, with increased ground clearance, optimum traction, durability, comfort and steering precision. 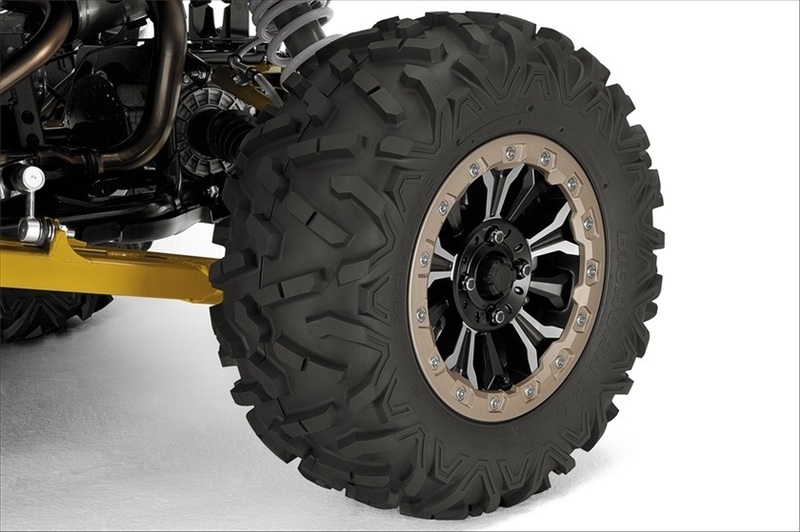 These tires are mounted to tough 14-inch alloy wheels with standard bead lock plates for maximum tire durability, especially in challenging terrain. 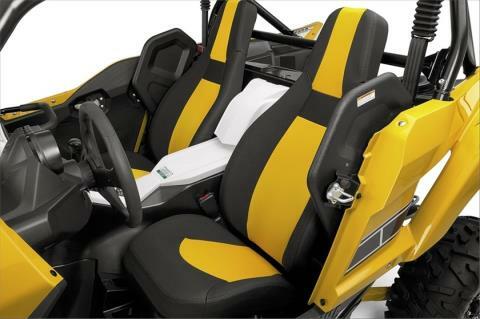 Ergonomics Built for Performance: The YXZ1000R SE cab features plush high-back seats with extra lateral support and outside shoulder bolsters, and both the driver’s seat and passenger handhold are adjustable, giving riders the feeling of being part of the vehicle for an excellent cockpit feel. The floorboards are shaped to provide generous legroom while still giving a planted feel during aggressive riding, and the steering wheel is tilt adjustable 5.8 inches to fit drivers of all sizes. 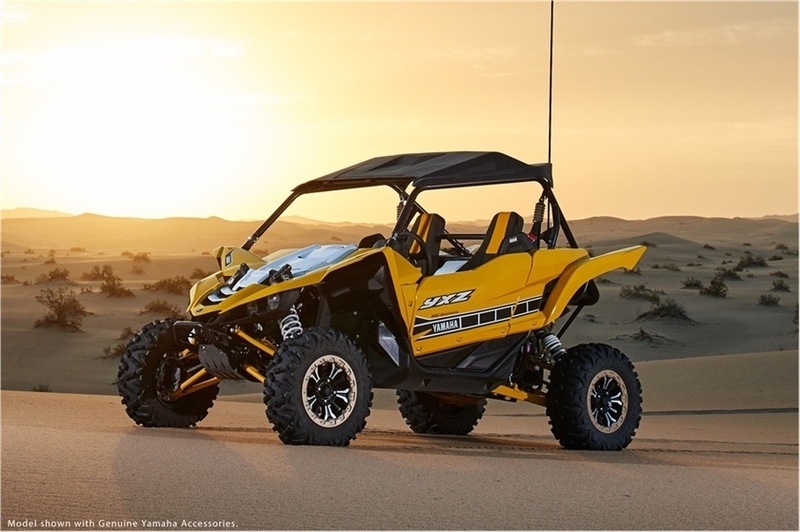 Supersport-style Dashboard: The YXZ1000R SE features instruments inspired by Yamaha’s high-performance supersport motorcycles. 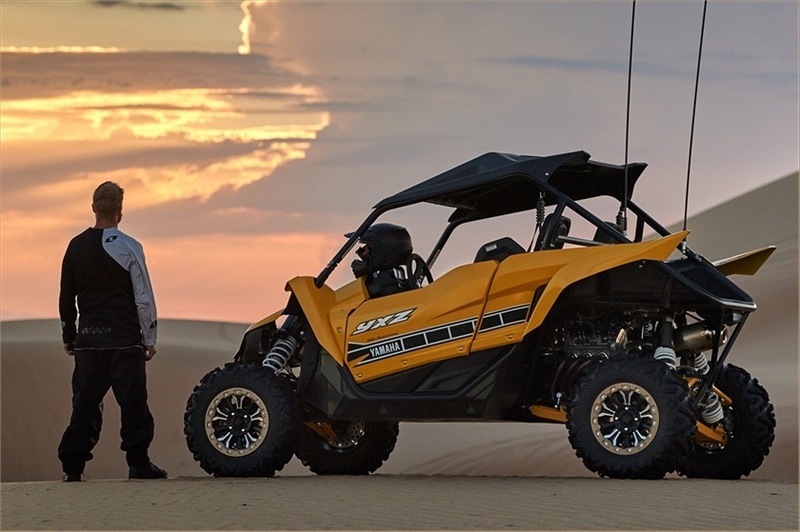 Functions include a high-visibility digital speedometer, analog tachometer and programmable shift light, with digital readouts for 4WD mode, gear position, fuel level, trip meters, hour meter, coolant temperature warning and a clock. 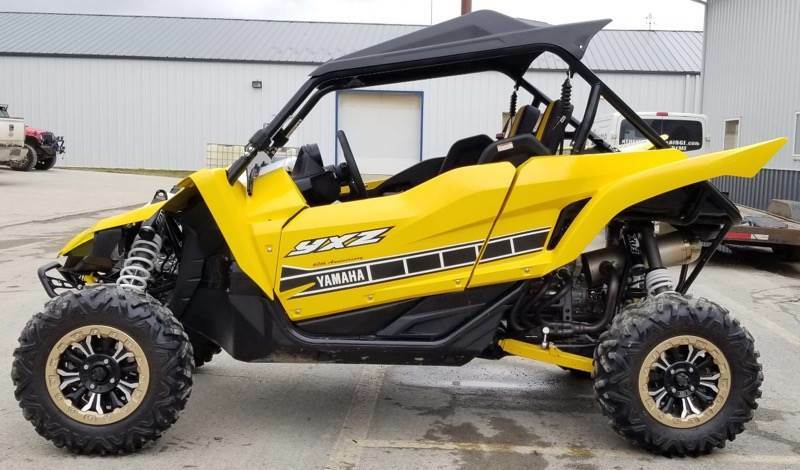 Special Edition Features: In addition to the durable bead-lock wheels, the YXZ1000R SE is highlighted by a stunning 60th Anniversary Yellow and Black graphics package with matching A-arms for standout style. 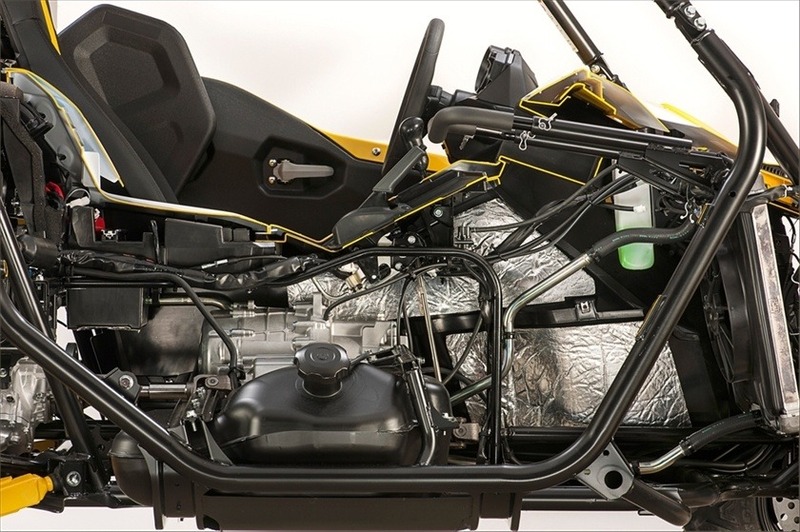 300-pound Cargo Capacity: Bring what you need, thanks to the YXZ1000R SE's composite cargo bed, with a 300-pound capacity and four steel tie-down points. 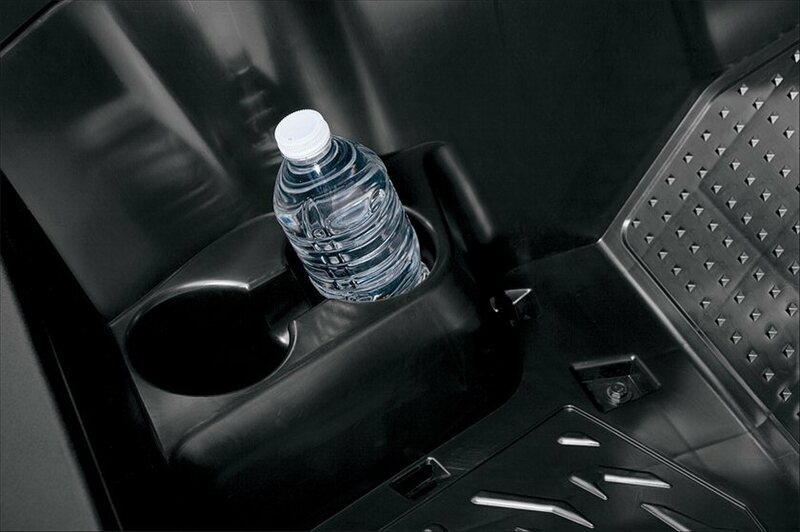 A sealed compartment next to the cargo bed and glove box in the cab provide additional storage, as do passenger-side cup holders and a central storage tray in the dashboard. 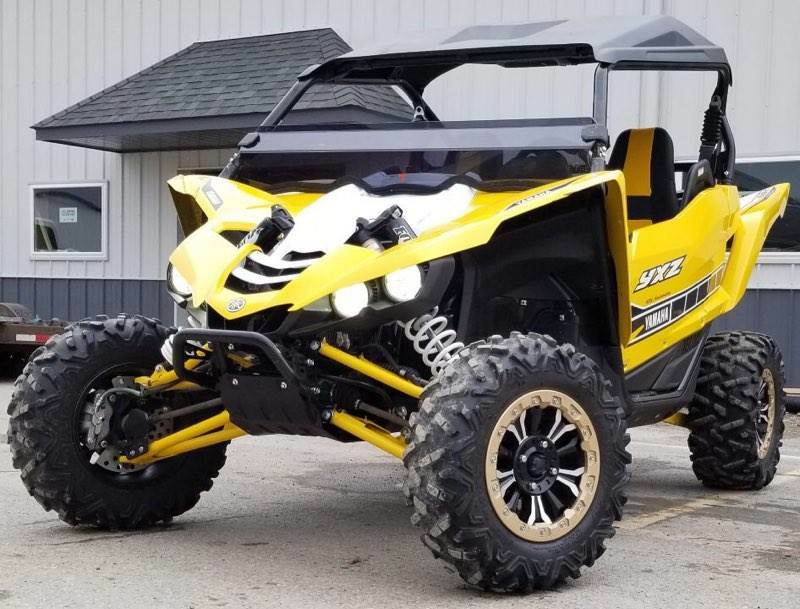 Aggressive LED Lighting: Four super bright and long-lasting LED headlight assemblies provide brilliant forward illumination and give the YXZ1000R SE a sinister and aggressive sense of style, with a bright LED tail light out back for extra visibility. 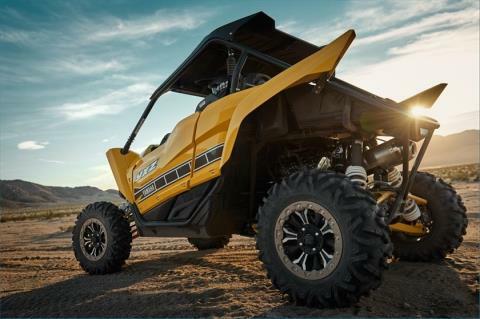 Assembled in the USA: The all-new YXZ1000R SE is proudly assembled in Newnan, GA, for world-wide distribution and is built to be Real World Tough™.